I just read the "Don't let this forum die" thread, so I'll come up with something to talk about. Gondolin is rather unique for an Elven settlement. In Beleriand, the other two great cities, Nargothrond and Menegroth, were both cave complexes, not above ground. Gondolin seems more Númenórean than Elven in terms of architecture and design, in terms of its walls, towers, and buildings. Tirion is another massive above-ground city, but it wasn't designed to be such a great fortress. When I think of Elves I usually think more of "grace" and "beauty" than such "brute force" construction. In later ages, east of the Ered Luin Elves built Imladris, Caras Galadon, and other places, but none were even similar to Gondolin. Ok sorry about the rambling.. post your ideas please! Well, I've always found Gondolin intriguing for that very fact- the Quendi are always associated with finesse and beauty, but the wars of Beleriand against Morgoth forced them into an odd position of proud defense of an adopted home (for the Noldor, at least). 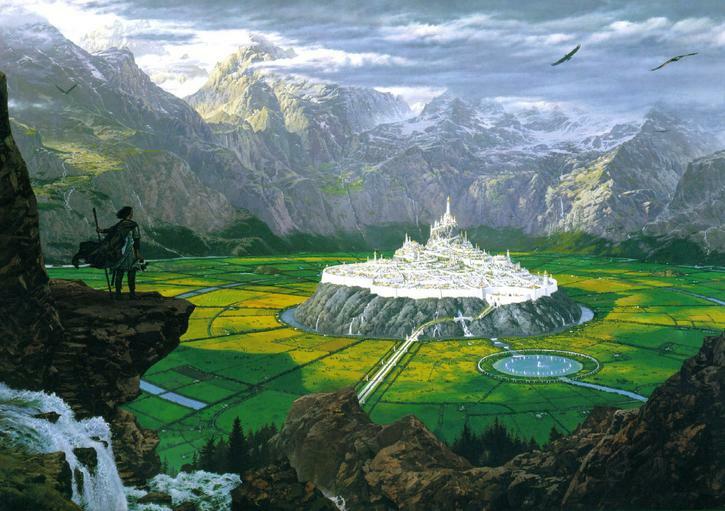 And Gondolin in paticular reflects a turning point in the Elvish approach to life in Arda. Turgon was a high born Elf, in line for the high kingship, and dwelt in Nevrast by the sea in a fairly high degree of luxury (I imagine) and was not faced with an overbearing amount of work as far as leadership went. Fingolfin and Fingon and Finrod took care of everybody. But, when the risk of attack by Morgoth rose to an uncomfortable level, Turgon took upon himself the appointment bestowed upon him by Ulmo and built the impregnable rock of Gondolin; he rallied his people to him, led them to this haven and gave them a place where the Elven nation one more outpost where it could nurse its strength. Turgon built a fortress when he was having Gondolin built, but let us not forget the incredible beauty Gondolin was supposed to have posessed; towers, blades, spires, stairs, fountains. However, one must end up viewing Gondolin as a tragedy in and of itself, even if it hadn't fallen. It was a caged bird that grew to feel it was the center of the earth. There's more to be said, but I'm sleepy. Edit: Well, that didn't work of course. Typical! But the link works, I guess! well..i decided i wud try to post it here so u dont need the link!!! WOW! If it looked like that I can see why Turgon was reluctant to move! Aye, Gondolin has always been my favorite location of the First Age, as Turgon is my favorite character. Everything about it interests me. Awesome, just awesome. You gotta love Gondolin. I just wish that the fellowship would get back together on an expedition to find the lost city. Also, It's location sunk with the rest of Beleriand. I imagine though, that when Beleriand gets raised back up, that it will be rebuilt. Yes the city was destroyed by Morgoth, but perhaps ruins of the city still remain. Also, yes Beleriand was utterly transformed by the War of Wrath, but Middle Earth still has traces of Beleraind and perhaps something is left of the great and ancient city of Turgon. Its a possiblity, right? Imagination people, you know if Tolkien came up with the idea and wrote about it, you would love it. Well, according to some maps the hill of Himring (sp?) survived, and so was an island off the coast of Middle-Earth. If you wanted to, you could imagine that Gondolin remained above water too, since it was in the mountains. One of my favorite stories that was published after Tolkien's death is the Fall of Gondolin, either in Lost Tales 1 or 2. I really wish that Tolkien could have completed it (or, I guess I should say made it compatible with the other ME stuff) before his death. oh that picture was incredibly gorgeous!!! Indeed I cannot find words to say how wonderfully it fit the picture in my mind's eye. Turgon is also one of my favorite characters, and Gondolin was my favorite city in the Silmarillion. Ah yes, to dwell in Gondolin for a time1 I always envisioned it to be a beautiful mountainous place! If the island of Himring survived, would the fortress still be intact around the 3rd age? I mean that was supposed to be a very powerful fortress and imagine all the interesting things you could find there. I too agree that Gondolin was an incredibly beautiful city. Its great beauty mighthve bee its downfall, because it led to Turogn being overconfident about the strength of the city. Mothgon Tuor most likely had blonde hair. Thier is a passage where Turin claim that he is not embarrased to have inherited his mother's dark hair unlike Tuor, who has thier grandfather's blonde hair. Thier is a passage where Turin claim that he is not embarrased to have inherited his mother's dark hair unlike Tuor, who has thier grandfather's blonde hair. I seem to vaguely remember that passage, but am at a loss to know where exactly where it is. May set out to find it. If the island of Himring survived, would the fortress still be intact around the 3rd age? ... well I think this is a big if. Tolkien did think so at one point -- that an isle called Himring [Himling on the old map] survived, as well as a huge Isle from a part of Dorthonion -- but I'm not sure he held to this notion. It did not make it on the map for the first edition, and if that was mere error, it did not make it onto the map for the second edition, nor the version produced by Pauline Baynes -- on which Tolkien did add some new things actually. The isle of 'Himling' was noted in Unfinished Tales, but it seems to hail from an old map. Treebeard implies that Dorthonion lies beneath the sea, although one could argue that he himself might not be aware of a large isle in any case. In later writing [to look at texts rather than actual maps] all I can find is the text that includes Tol Morwen.